To compress you have to use the same compressors that I sent you in the zip, and also for decompress. 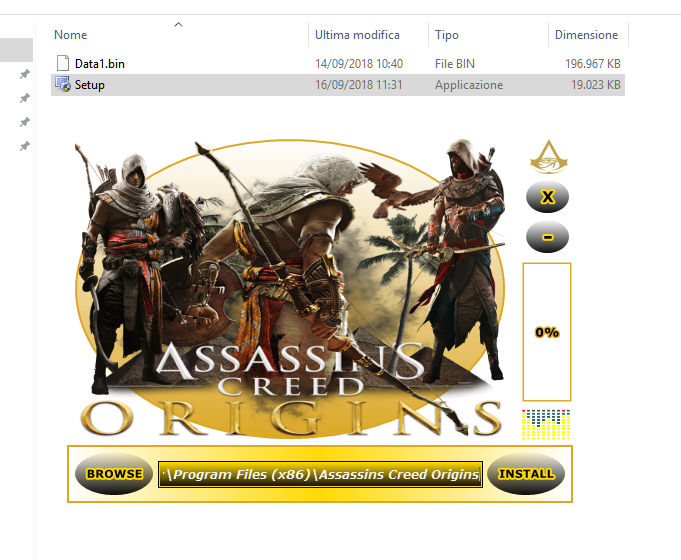 I created this installer tested for "ACO" with your method in half an hour, you just need to put the archives in the executable path and try. Use this package to compress the game, tested in compression with the files you sent me, and decompressed with the ISS archive that I sent you on the previous page, if you still have problems, my solutions do not belong to this world anymore. It has problems with big input (look in xtool topic). You will get "write error (disc full)" error. You have to divide all forge files into 2 halfs, but output will bigger this way then using afr. In this way you only confuse the ideas, it is already 2 days that @ ZAZA4EVER is trying to compress and create an installation, if you change the method and compressors every day, in the end, you choose WinRar as a compressor. Last edited by ZAZA4EVER; 16-09-2018 at 13:15. Last edited by ZAZA4EVER; 17-09-2018 at 13:43.